Butternut Squash—One for the small shares, two for the large shares. Grill, bake, roast, or make a soup. We used them in a fantastic beef soup yesterday with grass fed round steak, red wine, carrot, and onion. So good! We hope to get that recipe up on the blog for you soon. Jalapeno peppers—Each share received a handful of lovely jalapenos. Cucumbers—Surprise! We thought they’d be done for sure after last week, but the plants gave us juuust enough to give everyone one or two cucumbers. Bell peppers—Each share received a few bell peppers. We can’t believe these are still going strong. San Marzano tomatoes— We are so pleased with this crop this fall. Our large share members are receiving a quart of these heirloom Romas: San Marzanos. These tomatoes are low in moisture and peak in flavor. They’re great diced into salsa, or used in Italian cooking. Heirloom tomatoes—small share members each received 4-6 heirloom tomatoes, perfect for slicing and eating fresh. A few Japanese Black Pear made it into some of the boxes (these are somewhat pear shaped with green shoulders that don’t fully ripen) but most of you received the Cherokee Purple and Brandywine tomatoes. Take note that some of your tomatoes are quite ripe and need to get used up quick, especially if they have blemishes, and some of your tomatoes may need a couple of days ripening on the counter. Onions—Sweet red onions from our summer harvest. They’re pearl-sized so they’ll take a little work to peel and slice, but they’re super good. Sweet potatoes—If you haven’t yet made our spicy sweet potato soup with greens, it’s always a hit. Basil—Nice, large leaved Italian Genovese basil. We may not have this again. If temps dip below 40, it’ll be done. I suggest drying your basil, or making a batch of pesto to lengthen the summer flavor in your kitchen! Like we mentioned last week, this crop is difficult to transport without it getting pretty wilty. When you get it, trim the stems and place in a glass of water as soon as you can. As a general rule, wait to wash any veggies until you’re ready to use them to help retain nutrients and prevent spoilage from excess moisture. The onions can be kept at room temperature. The bell peppers, cucumbers, and hot peppers will all like to be kept cool. They can stay out at room temp, but will only last a couple of days. In the fridge, you’ll have about a week. The tomatoes will be damaged and begin to get mealy if stored below 50 degrees, so the refrigerator is not the place for them. 60-80 degrees is optimal for tomatoes, with them spoiling faster in the upper range, and slower in the lower range. Out on your counter or in some other cool place is perfect for them. Your basil will want to be trimmed and placed in a glass of water, out of full sun. It will turn black in the fridge, so don’t refrigerate. Thank you so much for being a part of our Spring CSA at Red Moon Farm, and for all your support of local, organic agriculture! 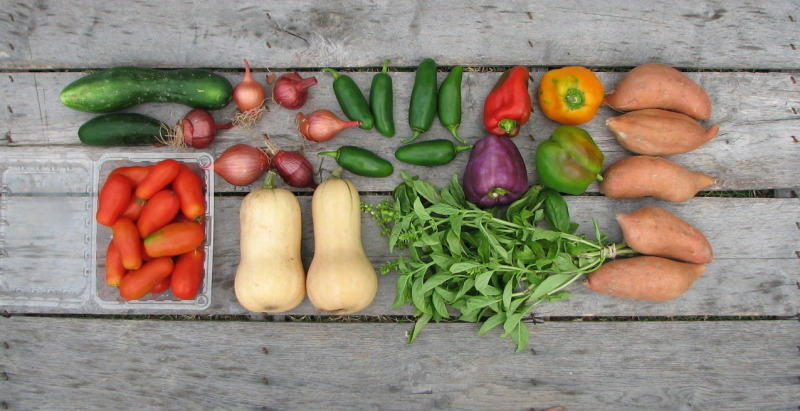 Large Share (L to R): cucumbers, San Marzano tomatoes, red onions, butternut squash, jalapenos, bell peppers, Genovese basil, and sweet potatoes. Small share (L to R): Sweet potatoes, bell peppers, heirloom tomatoes, cucumber, butternut squash, jalapenos below, Genovese basil, and red onion.